Generally speaking, we’re eating pretty simply (albeit deliciously) now: the vegetables pouring in via our CSA share, the local farmer’s market, and our garden are just so darn delicious that you don’t have to do much of anything to them to eat really well. But, I still do like to look for new ways to use them that I haven’t tried before — hence these pancakes. My procrastination outlet trusty recipe source epicurious.com has a really great new-ish feature: a whole section on seasonal cooking, several different feature ingredients for all four seasons. Look at all these good summer ideas! So, if you, like me, are wondering what the heck you can do with ALL your zucchini, some good ideas await. 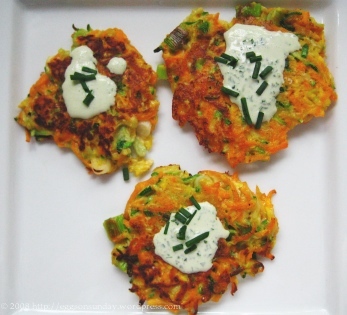 I found a recipe for zucchini pancakes with basil chive cream, and made those first. They were fabulous. So then, with the carrots and zucchini and summer squash we received in our CSA share, I made them again a few nights later: and we liked these even more. The recipe has two whipped egg whites in it, which act like a really wonderful, light, cloud-like binder for the vegetables. The two times I made this recipe, I tried it once with whipping the egg whites and once without — it’s definitely worth the 2 minutes it takes to whip them. The pancakes made without whipping the egg whites were a little heavier, and fell apart a bit more easily. I’m just sayin’…it’s worth the time. 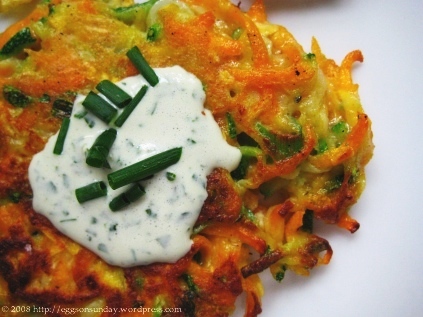 While the original recipe uses just zucchini, and that is a delicious way to make these too, I like to use a combination of zucchini, yellow squash, and carrot when they’re all in season. I make mine roughly 1/4 cup-size, versus the tiny appetizer-sized pancakes suggested in the original recipe. They’re delicious for a light main course with a salad or other sides, or as a first course before the main event. And one last note: the basil-chive cream is so, so good over pretty much any vegetable! In the bowl of a food processor or a blender, blend together the sour cream, basil, chives, and salt until smooth and pale green. Chill under you’re ready to serve. Place a large colander in your sink. Put the zucchini and yellow squash shreds in the colander and toss with the 1 1/4 teaspoons salt. Let the squash stand at room temperature 20 minutes in the colander, then take handfuls at a time and squeeze them firmly to wring out as much liquid as possible. (If you’d rather, you can put handfuls of it on a kitchen towel or paper towel and firmly blot it dry, but I find the hand method is most effective.) You really want to be sure you get as much water out as you can, otherwise they won’t cook properly. Transfer the drained squash to a large bowl and stir in the 1 cup of shredded carrots, flour, sugar, and pepper. Use an electric mixer to beat the egg whites with a pinch of salt until they just hold stiff peaks. 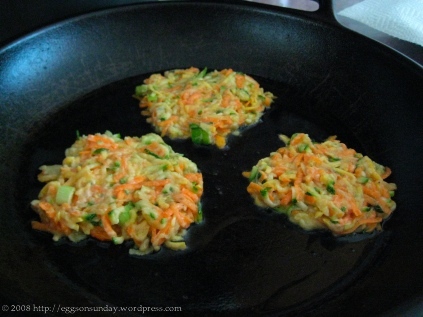 Gently fold them into the vegetable mixture. Heat about 2 tablespoons of oil in a nonstick or cast iron skillet over medium high heat until very hot. Work in batches of 3, and scoop about 1/4 cup batter per pancake into the skillet, flattening and smoothing each slightly with the back of a spoon. Cook the pancakes until golden brown on both sides, flipping halfway through. Transfer the cooked pancakes to paper towels while you cook the next batch. When you’re done, sprinkle all the warm pancakes with a little sea salt. Serve drizzled with some basil chive cream. Makes 6 medium pancakes, enough for a light dinner for 2 with a salad or other sides. I’ve been wanting to make something like this for weeks. 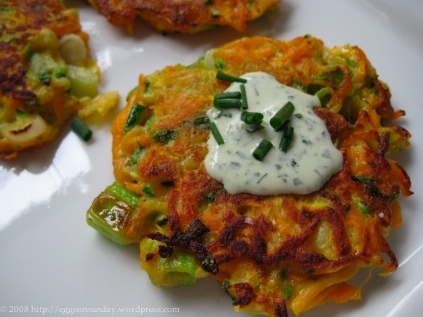 I have a bunch of summer squash and zucchini and thought that little shredded squash pancakes would be perfect. Now I have a recipe to try. Thanks! I’ll just have to substitute something else for the flour. These look wonderful! I am going to try these for breakfast – always looking for a few ways to get more vegetables in during the a.m. hours. Yummy! I think this will be my dinner for this evening – thanks! These are totally up my alley … on the menu for this weekend. Delicious! And beautiful. And about the basil cream: there was an audible “mmmm” from this reader when she got to the bit about it drizzled over roasted beets. Amy these look absolutely irresistable! I am going to make them and I imagine that we could substitute vegetables if we wanted a different assortment. Love the basil cream on top also. These look so summery, fresh and yummy! Love it! Oof, theses look delicious. I’ll try them this weekend! Also, what type of camera do you use for these awesome pictures? What a great blog! 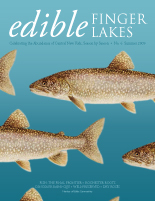 I love your photos and seasonal foods focus. Also, I love zucchini pancakes. I made some with shredded potatoes and onion earlier this summer, but I love all the additional vegetablees and will have to try this. I just made these and they turned out great. I whipped the eggwhites like you. I have to admit, the best part of this whole dish is the sauce! I cant wait to dip everything in it! I was licking it off the spoon! Very good. Thanks for posting!